Shrimp /Prawn is my favvvv seafood .. I don need any gravy /kulambu if prawn is there, I'll just mix the masala with rice,drizzle few drops of sesame oil & lil bit of salt ,omg ,it would be awesome . This masala is one among my favourites.. U can even have this masala with dosa ,it taste yummy with anything .Adding of tamarind paste at the end leaves some sweetness to the dish and I've learned this tip from Chef Damu Sir..
Green chilly -- slit open -- 1 no. Clean the prawn and keep aside. Take a kadai and pour the oil. Add the onions and saute well for 2 minutes. Add the ginger garlic paste and saute well for a minute. Add a little bit of salt while adding onions, that makes the onion to cook fast as it leaves moisture. Add the tomatoes and the curry levaes and cook well until the tomatoes gets cooked. Now dump in the garam masala powder , green chilly and scald well. Followed by turmeric powder,red chilli powder,coriander powder,pepper powder and combine well. Saute this mixture so that the raw smell of all the dry powders disappears. Now add the cleaned prawns and mix it well. Cook in the low flame. U may add 1/4 cup of water now and close the kadai. Let this cook for 2 minutes. Then add the tamarind paste to the prawn mixture and combine well. Cover the pan again and cook for 3 more minutes and switch off . Garnish with coriander leaves and serve..
Ahhh mouthwatering... My frozen shrimps are waiting to get out.. i will welcome them with this recipe.. OMG!! !Am drooling here...Awesome prawns masala , Shanavi.. 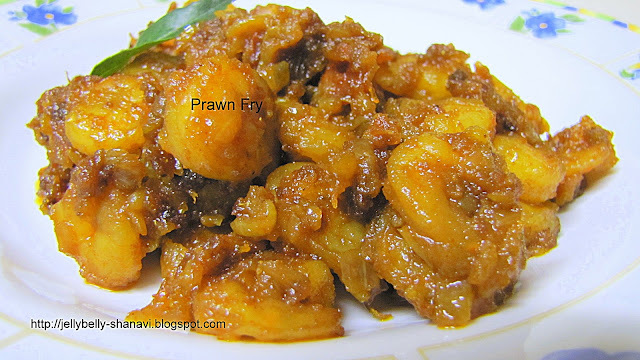 Tempting prawns masala..looks so delicious. wow..prawn masala looks so delicious..
My son's fav. Looks yummy. Thanks for dropping be Shanavi and leaving your comments in my space.